The C37LG & Kevin Derrick of Strathwood publications, are proud to offer you a 96 page hardback pictorial book celebrating (or showcasing if you like) fifty sterling years service of the English Electric type three's or British Rail Class 37's. 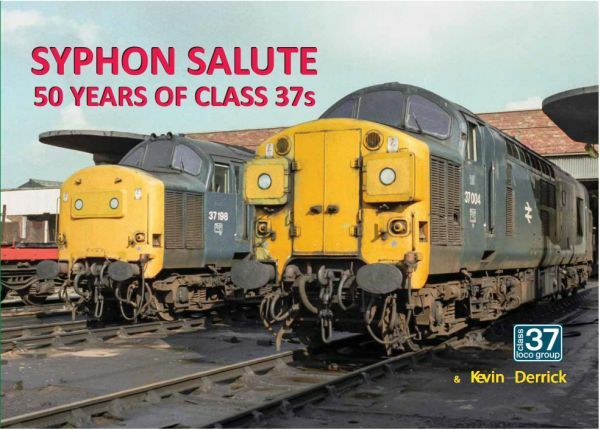 The book is split into seven chapters showing some of the best images of Class 37 workings on various freight and passenger workings, that they were renowned and remembered for. This will bring back memories of the Licky bankers, as well as Triple-headed heavy freight to Ravenscraig and Llanwern. The green and BR blue eras, as well as regions that that were their common stomping grounds, the Eastern region, Scotland and Wales. With the sub class of 37/4's which earned themselves a cult following, and our own loco 37003 getting in on the act. Finishing off showing the class in the years leading up too, and after the millennium. By purchasing this book, all profits go towards the up keep and continual restoration of the groups locomotive at the Mid Norfolk Railway.